American Theater Company (ATC) announces a special community tour of The Project(s), a world premiere documentary play about the history of public housing in Chicago, to the Cabrini-Green and Wentworth Gardens neighborhoods this month. Free public performances will be held at Edward Jenner Elementary Academy of the Arts on May 17 at 6 p.m. and Wentworth Gardens Field house on May 24 at 5 p.m. Seating for both performances will be available on a first come, first served basis. Additionally, a select number of free tickets are available for all performances during the regular run at American Theater Company (1909 W. Byron Street, Chicago) now through May 24 for all former and current public housing residents. Interested residents can call ATC at 773-409-4125 for more details. Single tickets are $48 and are available at www.atcweb.org or 773-409-4125. 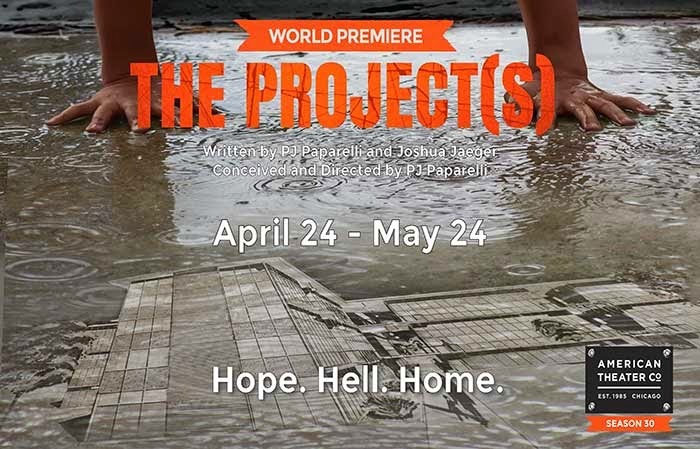 The Project(s) is conceived, co-written and directed by ATC Artistic Director PJ Paparelli and co-written by Joshua Jaeger. From 2010 to 2014, Paparelli and Jaeger conducted over 100 interviews with scholars, city officials, and former and current residents of public housing, including Chicago’s Cabrini-Green, Wentworth Gardens, Robert Taylor Homes and Ida B. Wells Homes. This verbatim material is innovatively combined with a cappella music, body percussion and stepping with choreography by Jakari Sherman, artistic director of Washington, DC-based Step Afrika!—the nation’s only professional dance company devoted to stepping. The ensemble cast of The Project(s) includes Linda Bright Clay, Omar Evans, Kenn E. Head, Joslyn Jones, Stephen Conrad Moore, Penelope Walker, AnJi White and Eunice Woods. Press opening: Tuesday, May 5 at 7 p.m. Regular run: May 7 through May 24: Thursdays and Fridays at 8 p.m.; Saturdays at 2 p.m. and 8 p.m.; Sunday, May 10 at 2 p.m. and 7 p.m.; Sundays, May 17 and 24 at 12 p.m. The Project(s) is supported by a generous grant from The Chicago Community Trust and the John D. and Catherine T. MacArthur Foundation. The Project(s) was developed, in part, with assistance from The Orchard Project, a program of The Exchange, and through residencies with the Jentel Artists Residency Program; Citizens Theatre Company, Glasgow, Scotland; Sheridan College & the Wyoming Theater Festival; and the Howard University Department of Theatre Arts.